Shenzhen, China & San Francisco, CA – March 27, 2017 – HTC Vive™ and Warner Bros. Pictures announced today a strategic partnership in which HTC Vive will be the exclusive VR partner for all content, online and offline activations for the highly anticipated theatrical and home entertainment release of Steven Spielberg’s Ready Player One. Adapted from the book by Ernest Cline, Ready Player One is a sci-fi action thriller that unfolds largely within the virtual reality space. The film is slated for global theatrical release on March 30, 2018, from Warner Bros. Pictures, Amblin Partners and Village Roadshow Pictures. Vive will produce multiple pieces of VR content tied to the world of Ready Player One. This content will be available to users through Viveport, which will distribute the content globally across all VR in-home platforms, from high-end PC based VR systems to mobile solutions. In addition, Vive plans to bring Ready Player One-inspired content to its Viveport Arcade platform for location-based entertainment as well as showcase the VR experiences and games at many of the biggest global consumer events through the year. Academy Award winner Steven Spielberg (Schindler’s List, Saving Private Ryan) directed Ready Player One, starring Tye Sheridan, Olivia Cooke, Ben Mendelsohn and T.J. Miller, with Simon Pegg and Mark Rylance. Zak Penn and Ernest Cline wrote the screenplay, based on the novel by Cline. The film is produced by Spielberg, Donald De Line, Dan Farah and Kristie Macosko Krieger, with Adam Somner, Daniel Lupi, Chris DeFaria and Bruce Berman serving as executive producers. Ready Player One is a presentation of Warner Bros. Pictures and Amblin Partners, in association with Village Roadshow Pictures. 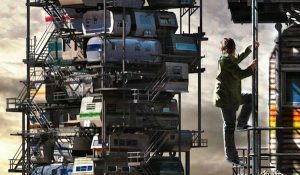 An Amblin Production, A De Line Pictures Production, A Steven Spielberg Film, Ready Player One will be distributed by Warner Bros. Pictures, a Warner Bros. Entertainment Company, and in select territories by Village Roadshow Pictures.